Initial shooting was to develop loads similar to the large caliber Bull Dog revolver loads of the late 1800s. Shown are round ball and 200 grain cast bullet loads. In case you do not recognize it, this is a page from the 1969 edition of the classic reference, “Cartridges of the World” by Frank C. Barnes. My first experience with the DoubleTap over/under Derringer was about two-years ago at the Shot Show when a company then called Heizer Firearms introduced a small slab-sided pistol chambered for the .45 ACP and 9 mm Luger. The company’s ads proclaimed them to be “Aerospace Technology Firearms” that would introduce modern design, technology and materials to make truly modern firearms. The people who manned the booth were quite proud of the fact that they had designed the gun in 30 days. I was interested because I had owned Derringer pistols that were generally variations of the Remington Double Derringer design, including one chambered for the .45 Long Colt. What I liked about both pistols were their small sizes, easy portability and large-caliber cartridges. The DoubleTap was an improvement in design in that it was more compact in profile and eliminated the external hammer of the Remington design. My first impressions of the DoubleTap sample pistols were favorable so far as their size and trigger pull was concerned. The trigger had a very smooth, relatively soft pull on these pre-production guns. Because of the narrow profile of the grips, I did have reservations about how these light-weight guns would handle chambered for the .45 ACP. I know of people who object to the recoil of the .45 when shot from full-size 1911-frame steel pistols, and I could not imagine how these lightweight guns would feel when shot. I was sufficiently interested to request one for testing, thinking that I would compare this modern pistol with a new Davide Pedersoli reproduction of an original muzzleloading Derringer. Ultimately the Pedersoli Derringer arrived, and I worked up loads for it. What I found was that this replica pistol shot far from the point of aim and was weakly powdered; but if a man knew his gun and could remember to aim a foot below his intended point of impact and about 6-inches to the right, he could hit his target. Historical accounts verified this general lack of accuracy at much beyond an across-the-table range. 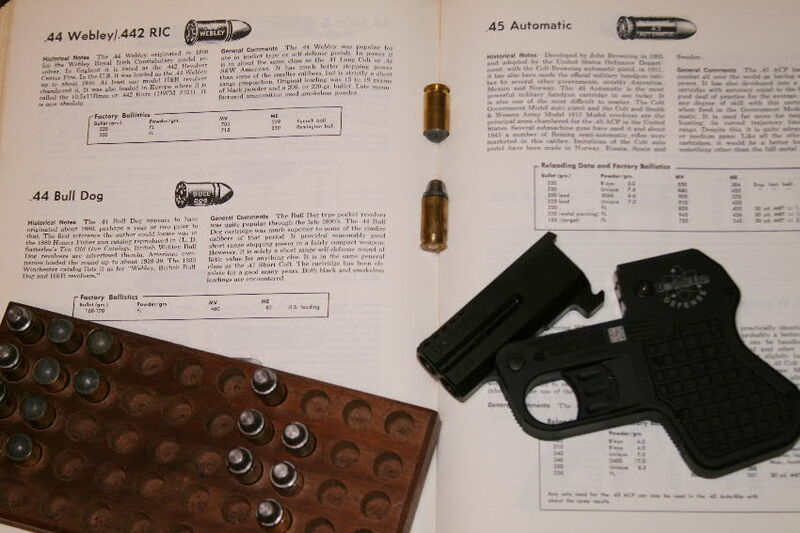 The DoubleTap offered the potential advantages of being a cartridge gun that could be quickly reloaded, did not need external percussion caps and had two shots in addition to being chambered for much more powerful loads. I did a YouTube video, “Lincoln Derringer Vs. Pizza Zombie,” which may be seen on YouTube at: http://youtu.be/YHileURpyi34. 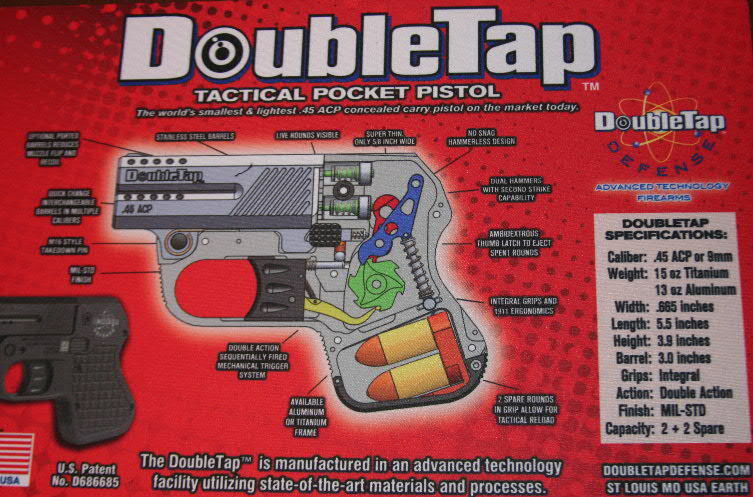 Legal and production issues delayed the production of the DoubleTap for about two years. In the meantime the Pedersoli Derringer had been shot and returned. Initial tests by other writers confirmed my expectation that the Double Tap was almost unshootable in .45 ACP. My initial concept in requesting the gun was to reload the .45 with loads that evoked the large-caliber rounds loaded in Bull Dog pistols of the 1800s. When my test gun arrived, I scavenged some cases from a firing range and reloaded them with .454 round balls and some 200 grain cast lead bullets. These loads were successful in that the round-ball and cast-bullet loads shot into the same general group as factory ammo, with less recoil and costs. In short, here were loads that a person could practice with without causing physical pain, although you did certainly knew that you had shot something with the cast-bullet load. You can see my video “Taming the DoubleTap Defense” at: http://youtu.be/qzCr1-qDBP4. As a young military officer stationed near Alexandra, Virginia, in the late 1960s, I purchased and, in succession, shot most of the world’s 9 mm pistols. These included Broom-handled Mausers, Lugers, Radoms, Browning Hi-Powers, Lahtis and others. I would shoot one for a time, trade it in and get another. What these guns lacked during the day was the availability of anything but full-metal-jacket bullets. I was interested in hunting with them and ultimately progressed to the .38 Super, but was still hampered by the lack of reasonable bullets. 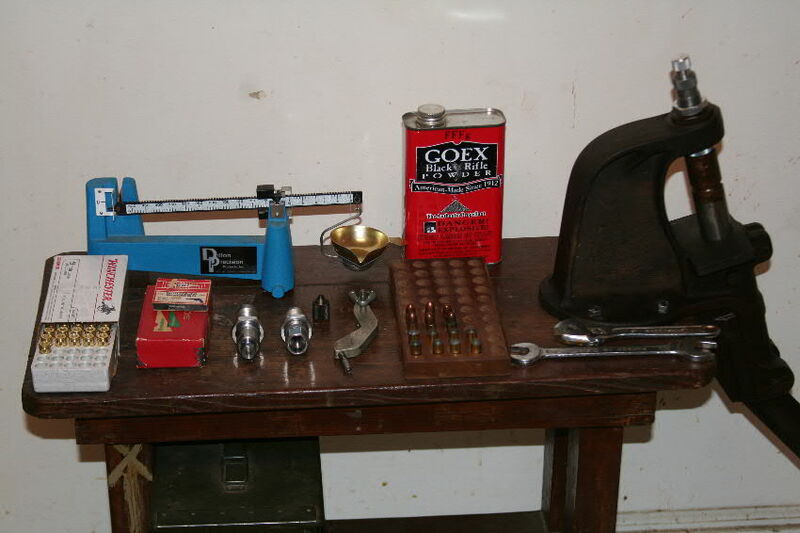 Using hand tools I reloaded for the Super and used Remington’s 125-grain jacketed bullets. Single-stage press bolted to small reloading bench. When I received the DoubleTap it also came with a 9 mm barrel, and I had a nearly full box of 9 mm bullets that I had saved. A problem with my Lyman Tong tool reloading of the .45 was that I could not fully resize the brass cases. However, I also had an old Herter’s reloading press from the 1960s, and I ordered a new set of carbide Lee reloading dies for 9 mm. I found a box of Winchester 9 mm target loads in a gun shop which would provide me with factory rounds for testing and empty cases for reloading. These target loads are still fairly stout so they can function in a variety of 9mm semi-auto pistols. With the fixed-breeched Double Tap, any load that was sufficiently powerful to throw the bullet out the barrel would work. Shooting off 15 rounds at stumps revealed that the 9mm barrels shot to different points of impact vertically and also to the left. The 9 mm factory rounds were uncomfortable to shoot, but not nearly so bad as the .45 factory loads. Starting this year, the DoubleTap also has available a rubber over-grip to reduce felt recoil on the hand. Although I did not use it with my initial shootings of the gun, I used it during later bench testing. This over-grip cushions the impact of the pistol’s recoil, but for the next several days my hand was still somewhat stiff. I had my first failures to fire when shooting this factory ammunition. The primers were slightly indented, and they fired when hit a second time. Although my use of round balls in the .45 ACP a success, loading .350 round balls in the 9 mm cases with 9 grains of FFFg black powder gave very poor accuracy. Unfortunately the first round-ball shot took out my chronograph, ending any possibility of obtaining velocity and energy figures for subsequent shots. My reloads using the Remington 9 mm bullets and 8 grains of FFFb black powder were much more successful, and these grouped about 4-inches above the impact point of the Winchester factory loads. I cannot say what the velocities were, but if the factory loads were going at 1000 fps, I suspect that my reloads were doing about 800. There was a marked difference in felt recoil between the two loads. I also loaded 3 grains of 700X, a clean-burning flake powder used mostly in shotguns and to a lessor degree in pistol rounds. This smokeless load about duplicated the black powder load, but was cleaner burning and would not require the soapy water cleaning of the gun and brass cases demanded by black powder. The number of misfires increased as the testing progressed. Thinking that a part of this problem might be that residue in the barrels was preventing the cases from being fully supported during firing, I washed and cleaned the barrel. This appeared to help. When I later cleaned the gun I found that one firing pin was jammed in the frame. I tried to free it with alcohol, but that had no effect. Residue from shooting the black powder rounds may have gotten into the firing pin channel and stuck the pin. I mention in the video that perhaps the mainspring was too weak, but on this gun increasing the spring pressure is not an option, as to do so would make an already tough trigger pull almost impossible to manipulate. Because of the gun’s double-action-only design, the trigger must fully compress the hammer spring for each shot. I found I had to take a two-handed grip and pull with two fingers, one on top of the other, to operate the mechanism. This is something that I never had to do with any gun that I have owned. To see the video “Shooting and Reloading for the 9 mm DoubleTap Defense” go to: http://youtu.be/KshNUxt3h0g. DoubleTap’s design shown on pistol rug. The trigger is linked to the hammer spring and must completely compress it before the gun will fire. As this gun cannot be taken apart by the owner, there was no way to access the firing pin to replace it or clean it. In my view this is a serious shortcoming for any self-defense pistol, as all mechanical things will ultimately fail. The best I could do was to try to loosen the stuck pin with alcohol, but that did not work. This gun has all of the problems of firearms that are designed by people who are engineers first and only shooters because they perceived a potential economic opportunity. The first requirement for any self-defense gun is that it must work, even under less than optimum conditions with less than perfect ammo. It must be easily operated under stressful conditions. It must also be field repairable. Looks, materials, shape, weight, size and expensive materials are secondary to functionality and reparability. The retail price of the pistol ($500 and up depending on the choice of an aluminum or titanium frame and options) reflects the high cost of engineering, production and materials; but there are a number of less expensive double Derringers that cost less, are more reliable and are repairable. The value of this series of tests was to demonstrate that users who may have to depend on their self-defense guns to preserve their lives must know their guns and shoot them enough so that their use becomes second nature. One design aspect of the DoubleTap is that the trigger must be fully released between shots or the second barrel cannot be fired. Another design factor is that both the .45 and 9 mm barrels shot to different points of aim vertically and also a few inches to the left at 10 yards. If you have to shoot someone rushing at you, 10 yards seems very close indeed, and you need to know where to aim so as to have the maximum probability of making a disabling hit. You also do not want to be even momentarily distracted because your hand hurts like hell after you have fired your gun. Thanks for your article. It will help for the user.